Despite the onslaught of hybrid and electric vehicle announcements from automakers, they’re still busy squeezing as much efficiency out of internal combustion engines as possible. It’s Toyota’s turn to improve its engines, like tweaking its 2.5-liter inline four-cylinder in the 2018 Camry to be more powerful and thermally efficient. Toyota is applying its new strategy for increasing thermal efficiency to a series of “Dynamic Force Engines.” This specific engine is the updated 2.5 liter inline four-cylinder that debuted with the 2018 Camry, but they’ve also done work to the 2.0-liter inline four-cylinder. The focus of the changes are to increase thermal efficiency, or basically, how much useful energy the engine gets out of combusting fuel. Toyota re-engineered the cylinder bore design to achieve a new ideal stroke-to-bore ratio of 1.18, which maintains similar volume over the old stroke-to-bore ratio of 1.09 but decreases the width of the bore and makes for a longer piston stroke. The second change increased the angle between the intake and exhaust valves from 31 to 41 degrees, straightening the path of intake airflow and creating better circulation for the fuel mixture in the combustion chamber. Both of these slight changes make for quicker combustion. 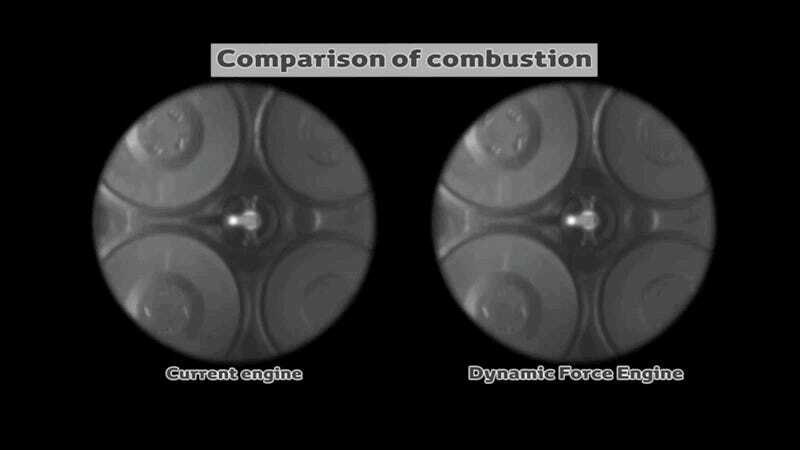 As the video shows, the Dynamic Force Engine combustion expands the full width of the cylinder in the same time it takes the older engine to expand about half of that distance. This quicker combustion, along with new electronically variable control systems for the thermostat, water pump, oil pump, and other systems that can be controlled to drain less power from the engine, contributes to increased thermal efficiency to 40 percent for the non-hybrid engine with a 13:1 compression ratio, or 41 percent for the hybrid setup with a 14:1 compression ratio. Just a few years ago, the average thermal efficiency of an internal combustion engine was less than 35 percent. Along with the increased thermal efficiency, Toyota claims the engine also gains slightly more torque and horsepower with the changes, which is always welcome. The 2018 Camry with the 2.5-liter non-hybrid setup is rated at 203 HP and 184 lb-ft of torque, and the hybrid is 208 net HP and 163 lb-ft of torque. Both achieve over 40 MPG highway. The increases seem to be only marginal, but a little better is still better.